This topic contains various types of Tree structures used in Admin with functions for navigating, multi-selecting, adding nodes, editing inline, and dragging items. Tree component will be needed anytime it is required to navigate though multiple layers of information and / or places where the information hierarchy needs to be shown to the user. 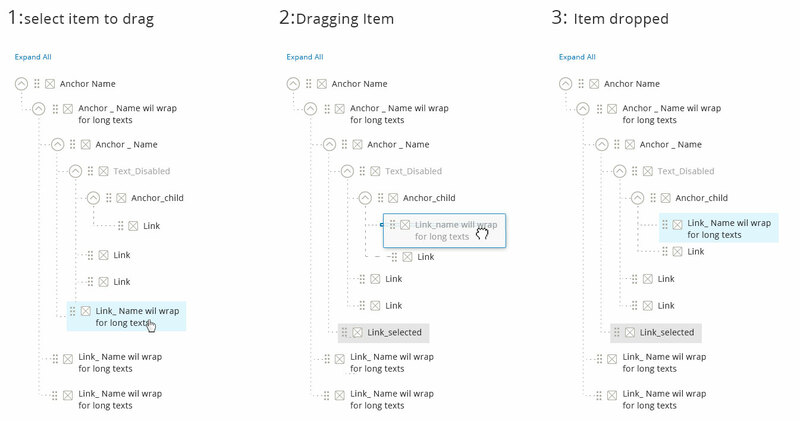 Anchors are items that always contain at least one child item and offer “expand” / “collapse” functionality by hiding or revealing its direct children. 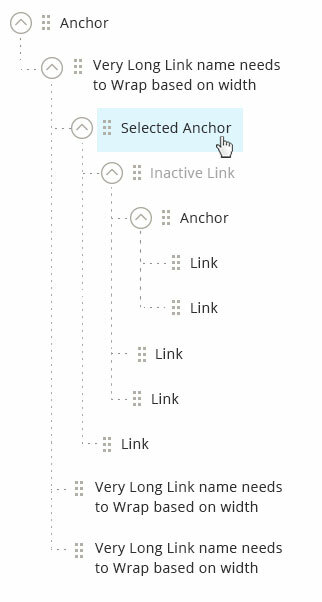 Link is a leaf level item which user can select to navigate to detail page or display details on same page. 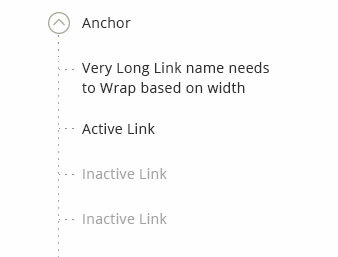 Active Link - Links that are active state and can be clicked to navigate to detail page. Inactive Link - Links that are inactive state and can’t be clicked. All trees must have these basic functional behaviors. The propose tree can accommodate “n” levels of parent child relation. But only 2 levels of nesting is recommended. The arrow to the left of the item can be used to expand or collapses the children of an item you are interacting with. 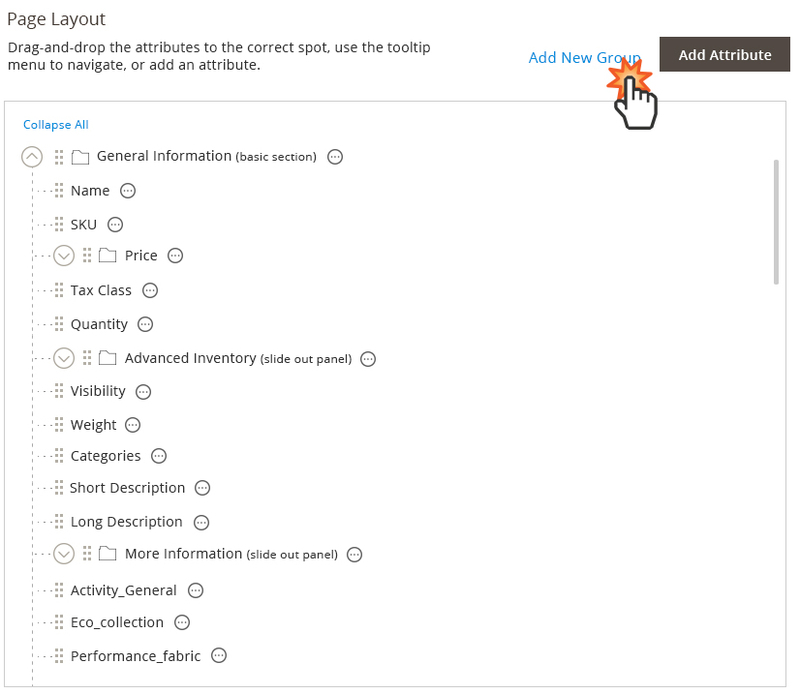 This is used to navigate to the detail page of the selected item in the admin or used as navigation to display more information on the same page. 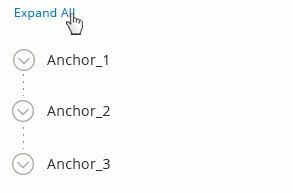 When tree is used to display more information on the same page the item clicked remains in selected state. This is used when multiple selection of items are needed. Icons should always be placed on the left of the icon label and Icons should NOT be used as default feature for trees pattern. “Select All” link changes to “Clear All”. 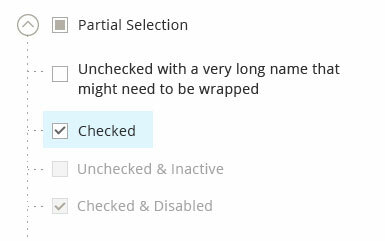 When Clear All functionality is triggered – All the checkboxes are deselected. The “Clear All” link is only shown when everything is selected. Note: The “Expand All/Collapse All” control can appear simultaneously with the “Select All/Clear All” control. They operate independently. 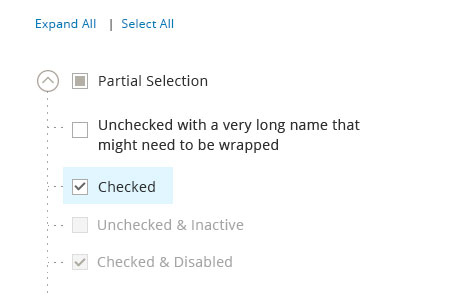 Checked and Inactive – this state appears when the item is selected and not active. Unchecked – if all children are in “unchecked” state. Partial Selection – if parent has a partial selection state, clicking on it will deselect all the child items. This can be used when user can drag and arrange items in tree. Drag handles are used when the capability of dragging and arranging in a tree is needed. When an item is dragged out and moved to a desired location, the drop area is highlighted to show acceptable region. Once dropped, the pick-up area disappears. If an item cannot be dropped into a specific location – the drop area will not be shown. 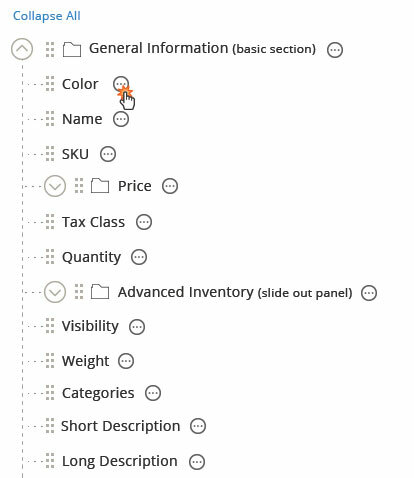 Checkboxes and Drag handles are mutually exclusive features. i.e. 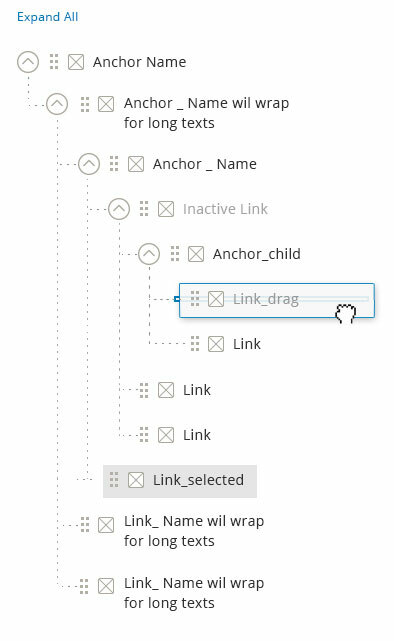 Tree structure that has checkboxes will NOT have drag feature and viz. Notes: Moving the Items in the tree will also affect the parent – child relationship. Action icon is used for any action that will be perform to the items in the tree. This may include edit, delete, move up, move down, etc. The action icon is not required for the tree. It only appear as needed. Step 1: User click on the action icon. Step 2: The list of available actions against this item is shown. 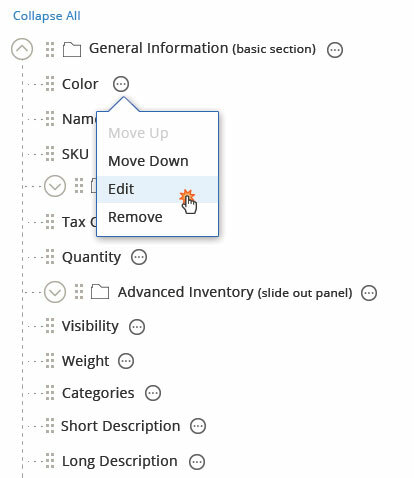 Move Up Once clicked, the item should be moved up within the parent. If the item is the first child, it cannot be moved up and the option will be disabled. Move Down Once clicked, the item should be moved down within the parent. If the item is the last child, it cannot be moved down and the option will be disabled. Edit Once clicked, this opens up a slide-out panel. Remove Once clicked, the item should be removed. A Group item This is the parent item, which means there can be children. Example: a folder for the media library or a new category . 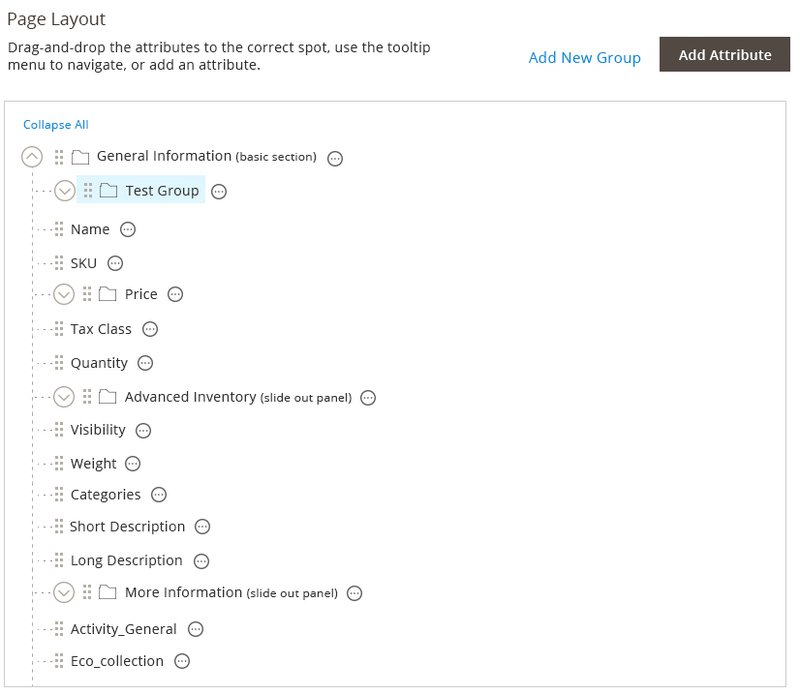 The group item can also be added to another parent group. This allows for n-level tree. An item This is the child. Example: a media item or a sub-category. The child item will be added to whichever parent is selected or to the same parent as sibling. The “add child” button should always have more importance than the “add parent” button. Step 1: User click on the add button. Step 2: A slide-out panel should opens up to get the details of what to be added. Step 3: The item is added. The placement of the items will be determined as stated above.